Shout out to my friend Brandi for bringing this photo to my attention. So apparently Essence Online has a section this week dedicated to braids. Which should be a cool thing, but then they throw this photo in the mix which is a terrible example for healthy summer hair. To be honest, most of the pics they showed were bad examples of healthy braids. They were all too heavy, too tight or just flat out bad. This photo is an example of the too tight braids. Clearly the stylist that did these extensions could care less about the health of this woman’s actual hair. Those braids are tension alopecia waiting to happen 🙁 Based on the photo gallery the person who photographed/edited this piece is either caucasian and doesn’t know any better, has relaxed/permed hair and doesn’t know any better, or is a natural who doesn’t know what healthy hair looks like based on their own bad hair routine. If you’re going to showcase natural hair, you’re going to have to do better than this Essence Online. Put some naturals on your staff who know what healthy natural hair looks like. Leave a comment and let me know what you think. I LOVE YOUR PASSION FOR OUR GOD GIVEN HAIR. Wow. How did she sleep? That looks BAAAAAAAAAAAAAD! My head hurts looking at it. SMH. Your skin should not bend when you get your hair braided. I don’t like how some braiders think they must braid so tightly. My braider had done my hair for about 6 years and she is kind to my head. OUCH is right! This is horrible! Take those out IMMEDIATELY!!!! I have a headache from just looking at it, TIGHT cornrows in any instance is destructive to healthy hair growth and density! NO NO NO NO NO!!! 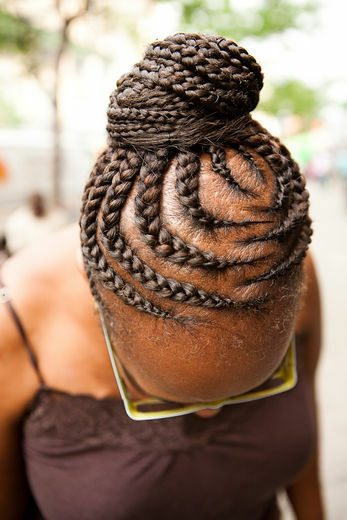 Not to mention that this lovely lady needs some aspirin from the too tight braids she’s wearing. OUCH. I remain amazed at the lack of understanding/acceptance regarding naturally textured hair, the proper use of protective styles such as braids and the examples shown not only in magazines such as Essence, but have you noticed the Google searches? Please, let’s do better here. Tension alopecia waiting to happen?! This lady is already balding and probably from years of follicle-pulling abuse… 🙁 It’s articles like yours that bring attention to the inaccurate examples of healthy natural hair like this one…Good looking out! Ouch! Yeah that looks really bad, and I would never suggest anyone to get their hair braided that tight, especially with added hair. Yes, the Essence Online staff must do better at showcasing healthy hair and hairstyles!